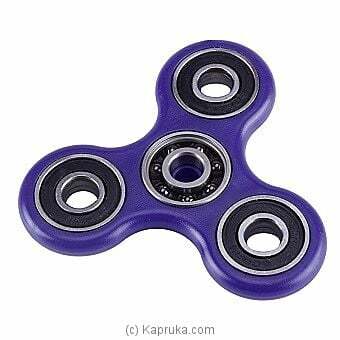 Perfect fidget toy to keep your hands busy or to just play with. It`s mini enough to put in your pocket, and you can take it out and have fun anytime. It`s not only fun and interesting, but also effective for focus, stress relief and deep thought. Great For Fidgety Hands, ADD and ADHD Sufferers Helps Relieve Stress. Easy to carry, small, simple, discrete and fun, also effective for Focus and Deep Thought. Whether you are the type to fumble over a computer's keyboard in search of that elusive key with a hash tag or whether you are a pro who has half of the most sophisticated gadgets in your locker you would admit that electronics and appliances are very much a part of our life and it is likely that they are here for life. The good news is that Kapruka is here to bring them to you; first to your computer screen through our e-commerce site and then to your doorstep through our widespread and efficient delivery mechanism. How a person gets about each day doing various chores and activities has changed drastically due to technology; everyone is contactable almost around the clock due to mobile phones, a lifetime of work is saved on a small device known as a pen drive or on a SD card, everyone has a mobile work station in the form of a laptop, cooking time has been cut in half with rice cookers, air fryers , blenders and juicers taking on much of the grueling work load and personal hygiene and styling has become even more rewarding with handy stylers and trimmers available at great prices. With so much technology surrounding us it is no surprise that people shop online for almost everything and even in Sri Lanka the trend of online shopping began some time ago. Purchasing trusted brands such as Philips, Acer, Samsung, Dell and Singer through Kapruka is a safe bet and the online price of these products would definitely be reasonable. Whether you are looking for a large screen TV, a new hair dryer, a fitbit, a pop up toaster, a pair of beats or an induction cooker, the virtual home of Kapruka is what you should visit. The very latest in technology, the most up to date designs and models and some of the most unmatchable deals in town for you, your home and your loved ones.